I was off on vacation for a week and have been back for a few days and getting back into working on the next version of Memorize-It. Before I left I had finished the tabbed test/quiz system in the standalone quizzer. This required a lot of rewriting in the multi-file loading system and cost an extra week's time. Now I'm into the testing side of the house. I had a conversation this morning with a potential customer who was asking about the t-scope feature. He had one idea that I may add to the list of things I'm going to do in v5. He asked me when it would be done and as usual, I have no idea when something this large is going to be done. The biggest problem being that I'm focused on building a new application/learning system built around Memorize-It Flashcards and once I get that done I still have some polish on Memorize-It to deal with. I've moved into the last big feature on the standalone quizzer/learning system and that as I said is testing. I first have to go back and redo the art for the test pane and I've started that and hope to have it done soon. Once that is done I think I'm into the testing (bug finding and fixing) and installer phase which will be very nice and feel like I'm nearing completion of a huge task. The second biggest problem is that I'm leading a trip to Africa in August and have been working hard on training the team, and I'm starting a new game development class in the fall. Both of those are beginning to impact the Memorize-It development effort. 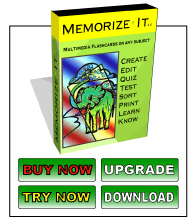 As usual, don't think delaying your purchase of Memorize-It will make any difference. I offer free upgrades to those who have purchased in the previous 6 months and my upgrade price (for any version of Memorize-It, even 1.0) is $10.